Planning is key to a comfortable retirement. It takes time and planning to build a nest egg for your retirement. After all that effort, take some time to plan as you approach retirement so you tap your savings in a smart way. In the last few years before you stop working, get your finances in order and sign up for federal programs that are there to help. Dipping into your savings can have tax implications, as well as implications for your long-term financial future. The approach to a major life change such as retirement is a great time for an overhaul of your financial life. Decide what your goals will be as you prepare to retire and then how they might change as you enter retirement. Target your available resources toward meeting your goals. One of the best ways to keep your retirement savings working for you is to reduce the amount you need to spend ahead of time. According to "U.S. News and World Report," few Americans are saving enough to carry them through a retirement that may last several decades. Take a long look at your budget, and consider ways to trim without sacrificing what's important to you. These may be major changes, such as downsizing your house, or they may be small, such as taking advantage of newly available senior discounts when you shop or eat out. 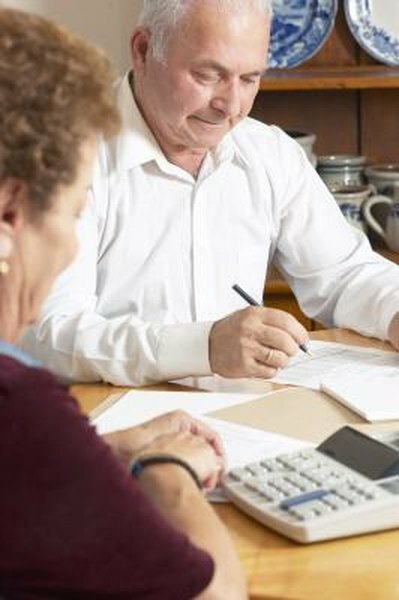 Different types of retirement accounts have different requirements and different tax profiles, according to Bankrate.com. If you have a 401(k) or traditional IRA, you will have to take a certain minimum distribution from this once you turn 70 1/2. But if you have a Roth IRA, there's no required minimum distribution. Prioritize how you will approach your accounts when the time comes. Plan to tap any conventional savings accounts you have first, which will be taxed at a low capital gains rate, followed by your IRA or 401(k), which will be taxed at your regular bracket. Save your Roth IRA for last, to keep the tax-advantaged funds working for you for longer. Think about how much should you take beyond the required minimum distributions once you enter retirement. While you want to live comfortably, you must assume you have many years ahead of you during which you'll need to support your lifestyle. A good guide is to spend no more than 4 percent of your portfolio in your initial year of retirement, according to Bankrate.com. That way your investments can continue to keep up with your spending. You should continue to rebalance your portfolio, ahead of and as you enter retirement. While the conventional wisdom is to adopt a more conservative investment profile once in retirement, many people are living longer these days, and it may not pay to have all of your investments in bonds or some other supposedly safe haven, according to Wells Fargo. Keep about five or six year's worth of living expenses in a conservative manner, but be slightly more aggressive with the remainder of your portfolio, so that you continue to earn the best returns and keep pace with inflation.